These days it’s hard to find a successful artist without an ego of some sort. Often, not too far behind success and notoriety comes a black cloud of doucheyness. Perhaps this is exactly why I was so taken in by the short documentary ‘Things That Can Kill You’ about the British artist Death Spray Custom. Death Spray Custom or DCS is a London-based artist that puts out some amazing tongue-in-cheek art in an otherwise all too serious world. 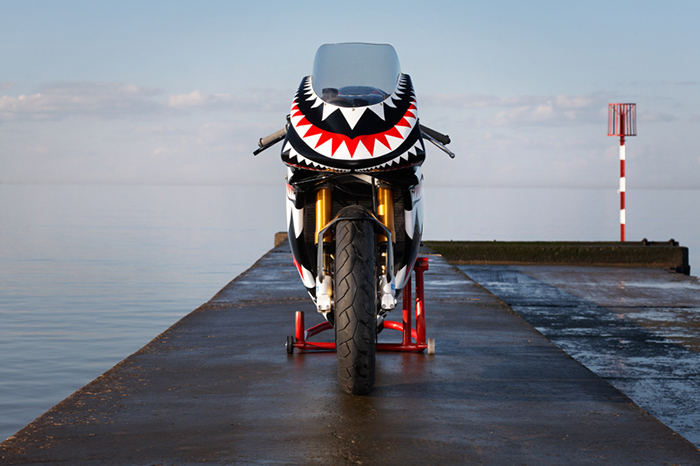 I’ve been a fan of his work since 2010, sharing work like his Triumph TR25 Scrambler or Black Polygon, a radically painted Ducati Desmosedici RR, but after hearing him talk about his laid-back approach to his art, I knew I liked him even more! DSC likes to keep his work light, or “a little bit taking a piss” as he puts it. It’s clear he’s having a lot of fun with it, as you can see by the toolbox above. His whole approach to why he only produces one of a kind work, to why he likes the subject matter he does, just seems to resonate with me. Talented, and down to earth? I’m not sure I can process this! All I can say is I wish more people took the same approach to their art. We’d have a lot less pretentious artists, and probably a lot cooler art to boot! His attitude is so casually punk rock, I love it! Here’s to marching to the beat of your own (amazingly painted) drum!